I've posted in the past about an ereader petting zoo in an airport, and I've even posted the occasional image showing how you could buy an ereader from a vending machine. But late last week i came across something new. It's a clever little program being run in Florida by Broward County Library, and it's one that a lot of libraries can probably duplicate. 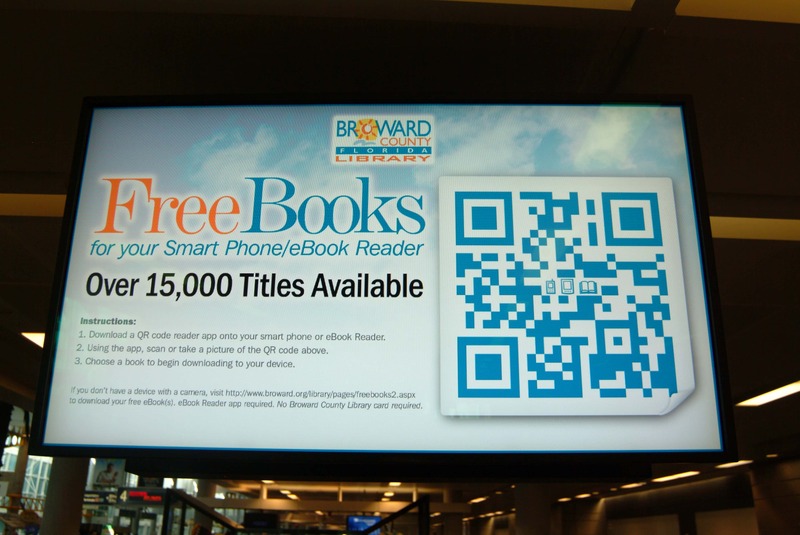 The BCL has set up 12 signs at the Fort Lauderdale-Hollywood International Airport promoting their free ebook downloads. You can find the signs near the baggage carousels. Assuming you have a camera equipped smartphone or tablet, you can use the QR code on the signs to visit the BCL website and download an ebook. They're offering downloads from a selection of 15 thousand ebooks, and you don't need a library card to get them. That's because the ebooks are provided by Overdrive, and they're drawn from the public domain titles on Project Gutenberg. These titles are available via any OverDrive partner library (as well as direct from Project Gutenberg). This is a good idea and it actually requires less hardware than I first thought. When I first read about this program, it sounded like they'd installed stations in the airport where you could browse the BCL collection. No, they just installed the signs. That's a lot lower cost than I was expecting, which means it will be easier for other libraries to duplicate. The airport is going to need either public Wifi or a high preponderance of travelers with data plans. Both are fairly common these days, so this isn't an issue. The key component here isn't the big sign; it's making sure people know that they can download ebooks for free while they are stuck in the airport (or anywhere, really). One alternative would be to arrange for advertising in airport mass transit, shuttle buses, and the like. A local library might even get the ads for free, given that they are a non-profit and offering a helpful service. Or a library could arrange for their service to be mentioned on the splash page for the airport's Wifi network. Have you ever used a public Wifi and had to agree to a TOS before getting on the web? That splash page would be a good way to get attention for this type of service. If anyone knows of other libraries who have launched a similar program, please let me know. It's simple but oh so useful.